Building upon the recent success of the D610 & D810 DSLRs, the Nikon D750 represents a new Nikon product line that sits between these existing models and borrows some features from each. 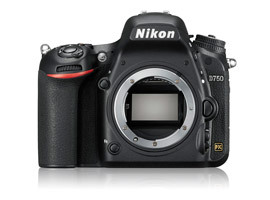 The D750 offers a similar design and build quality to the D810, which is a step up from the D610. Although featuring the same 24.3Mp resolution as D610, Nikon state the D750’s FX sensor is ‘newly designed’ and now offers greater ISO sensitivity between ISO100 – ISO12,800, expandable to ISO 51,200. Like the D610 the D750’s sensor also employs an Anti-Aliasing filter to smooth out finer details and avoid the adverse effects of Moire. This is in contrast to the D810’s 36.4Mp sensor, which has the filter removed allowing the sensor to recording greater detail. The D750 also slots in between the D610 and D810 models in terms of price with an initial body-only price tag of $2,297, compared to $1,797 for the D610 and $3,297 for the D810. It’s also marginally more expensive than the main semi pro DSLR competition such as the $1,899 Canon EOS 6D and $1,998 Sony a99. There are lots of mouth watering specs on offer for the cash however, including Nikon’s top end Expeed 4 image processor from the D4 series, 3.2” 1.3m-dot tilting LCD screen for shooting video, Multi-CAM 3500FX II 51-point autofocus system, 6.5fps continuous burst shooting and built-in wi-fi. Lets take a closer look at the scores for the new Nikon D750 sensor with comparisons to image quality results from its main competitors to see where its strengths and weaknesses lie. The Nikon D750’s 24.3Mp full frame sensor crashes through 90 points barrier to achieve an overall DxOMark Sensor Score of 93. That places it comfortably inside the top ten in the overall rankings and just behind the sensor scores from Nikon’s own D800 & D600 series, as well as the Sony a7R hybrid. The ‘newly developed’ higher resolution 24.3Mp sensor offers improved image quality over lower resolution Nikon sensors, such as those in the Nikon Df, D4 and D3s DSLRs. It is also notably ahead of other semi pro full frame offerings from Canon, such as the 5D MKII with 81 points or and EOS 6D with 82, where the D750 offers over 2/3rds of a stop better image quality. 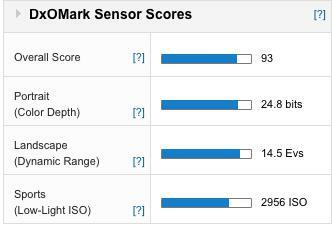 If we take look at the sub scores behind the overall DxOMark score we can see that there’s somewhat of a varied performance from the D750’s sensor however. Whilst all three scores are excellent, its strong point is certainly Dynamic Range where its score of 14.5Evs places it in 2nd place overall for all sensors on our database. In fact the D750’s sensor is only 1/3rd stop behind class leading Nikon D810 with 14.8Evs, and ranks above both the Nikon D600 and Sony a7 series cameras for Dynamic Range. For low-light ISO performance the D750 certainly holds its own too, with a score of ISO 2956 ranking it in 8th place overall. This is a very similar result to ISO on Nikon’s D600, D800E and D4 sensors and we can essentially say they offer the same quality in low light, despite the expanded sensitivity up to ISO 51,200. As you’d expect however lower resolution full frame sensors, such as those found in the Nikon Df and D3s, do offer a modest improvement over the D750 for ISO. The king for low light performance is still the Sony a7S, which with an ISO score of 3702 offers around 1/3rd stop better ISO than the D750. It’s in the sub score of Colour Depth that the D750 lags a little behind however, with a score of 24.8 bits ranking 14th overall. That’s the same Colour Depth score as the lower resolution Sony a7, but the Nikon D810 & D610 do offer better colour. There’s not much in it between the D750 & D610, with scores of 24.8 bits vs 25.1 bits, but the class leading D810, D800E and Sony a7R sensors, with scores of 25.7/25.6 bits respectively, offer over 2/3rds of a stop better colour than the D750. With three different Nikon product lines occupying the semi-pro DSLR space there’s lots of choice for the serious enthusiasts or pro Nikon shooters after a back up body. 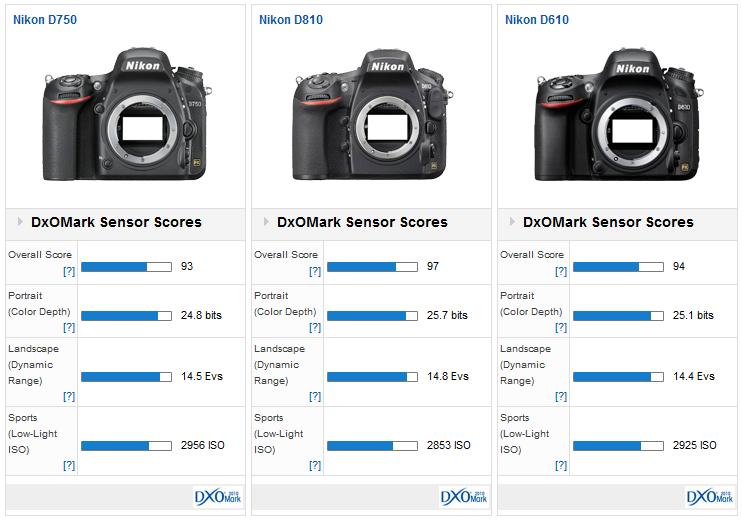 The D750 offers a similar 24Mp resolution to the Nikon D610 and achieves very similar DxOMark sensor scores, too. With an overall score of 94 for the D610 it’s just a single point ahead of the D750, but essentially they offer the same image quality with comparable results in all sub scores. Both the D750 and D610 are marginally behind the D810 overall however, which offers a significant improvement for Colour Depth with a score of 25.7 bits. All three Nikon full frame DSLRs boast comparable and outstanding results for Dynamic Range, which should prick the interest of landscape photographers, and the D750 is just ahead for low light ISO performance. If you need huge resolution and excellent Colour Depth the Nikon D810 is the one to go for, otherwise these Nikon sensors offer comparable and excellent image quality. If we broaden out the analysis to look at scores from the full frame semi pro competition from Canon and Sony, the Nikon D750 comes out on top. 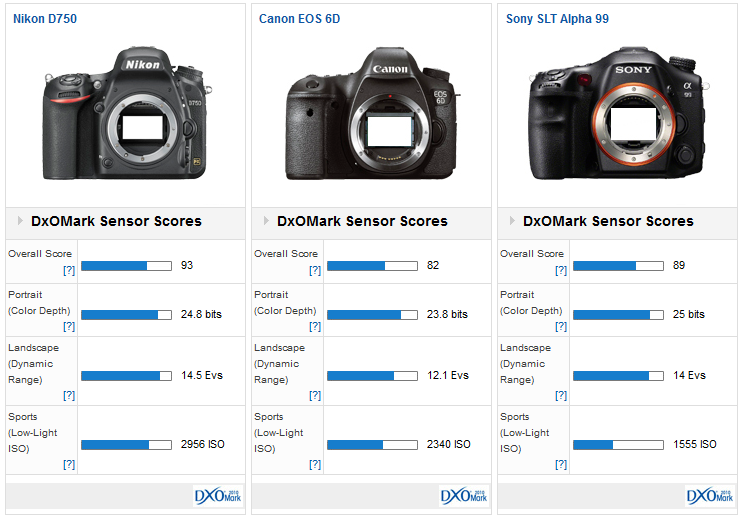 With an overall DxOMark sensor score of 89 for the Sony a99, and 82 for the EOS 6D, the Nikon D750 offers 1/3rd stop better image quality than a99 and a 2/3rds of a stop improvement over the EOS 6D. The Sony a99 wins for Colour Depth, but not by much, 25 bits compared to 24.8 bits for the D750, but both offer a 2/3rds of a stop better colour than the EOS 6D. The difference in image quality really starts to show in the Dynamic Range and ISO categories however, where the D750 comes out top in both. For Dynamic Range the D750 is ½ a stop better than Sony a99, with a score of 14.5 Evs compared to 14 Evs, and offers a big 2.5 stops improvement over the EOS 6D with 12.1 Evs. Low light ISO performance is the weakest aspect of the Sony a99’s sensor performance and with an ISO score of ISO2956 the D750 offers 1 stop improved low-light performance over the a99. Canon’s EOS 6D doesn’t fare too badly in this regard however, sitting in between the Nikon and Sony options for ISO with a score of ISO 2340.